Securely bung your full-size barrels with this locking bung. Great for tight bunging barrels while rolling them on their side, moving barrels from location to location, or simply for peace of mind that this bung will not accidently get knocked out of place. 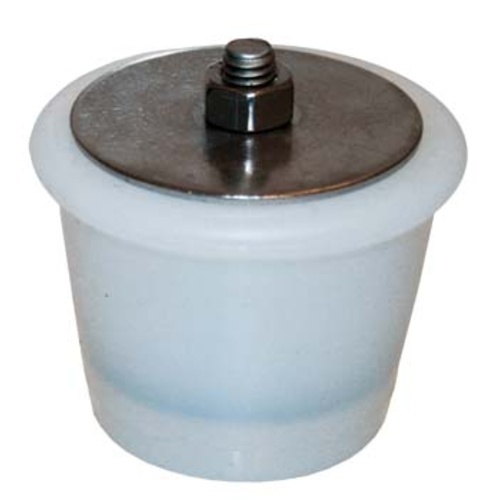 A stainless plate embedded in the silicone causes the bung to expand outward when tightened. This creates considerable pressure against the bung opening, ensuring a super solid seal. Use a crescent wrench or 1/2" driver to tighten the nut on top of the bung. Bottom of bung measures 1.5" and the top of the bung measures 2.5". I cut full sized holes in my Vadai 6 gallon barrels so I could use the argon transfer tool to rack wine. This product is designed for a once use only. I too bought one thinking I would be able to use over and over. It's designed so the nut locks in position. Don't buy this if you want multiple uses out of the bung. I bought two of these bungs. The instruction says tighten a maximum of 3 turns. After two turns, it's still easy to remove the bung. With 3 turns the thread stripped on both bungs.